Woolworths has taken an enterprise-wide view of its use of Salesforce for the first time, creating a centre of excellence (CoE) and funded it to improve internal capabilities around the platform. The CoE was set up with the assistance of Appirio, which is owned by Wipro. Woolworths has a five year-plus relationship with Wipro for various aspects of its IT infrastructure provisioning. Appirio’s global managing consultant for CRM strategy, Andy Anguelo, told Salesforce’s Dreamforce 18 conference that his team spent “a couple of weeks” inside Woolworths understanding its Salesforce use. “What we discovered was they were in really bad shape,” Anguelo told the conference. Anguelo’s team found seven lines of business within Woolworths that had each developed their own Salesforce orgs independently of one another. One of Woolworths' line of business uses is Bunch, an online community powered by Salesforce community cloud that lets customers try and review the supermarket's own branded products for free. “There was a tremendous amount of repeated code is what we found, a tremendous amount of repeated data so customer contact information was repeated across the different orgs and used in different ways,” Anguelo said. Appirio went to the lines of business one-by-one to get their support to come together into a centre of excellence, which also contained representatives for both Woolworths’ executive management as well as IT. “When we brought them all together they were kind of astonished that this was going on in the organisation,” Anguelo said. Appirio, however, was not surprised. The company said it routinely came across organisations whose Salesforce instances were operating poorly. “Woolworths were just operating. They were taking requests, they had a backlog [of work] and they were delivering,” Anguelo said. That kind of mindset - and the siloed growth of Salesforce - often caused enterprises problems, he continued. Woolworths - like others Appirio saw - operated Salesforce on a “project to project” basis. That meant there were “peaks and valleys with delivery capacity” in the organisation, tied to when the various Salesforce orgs had funding to play with. 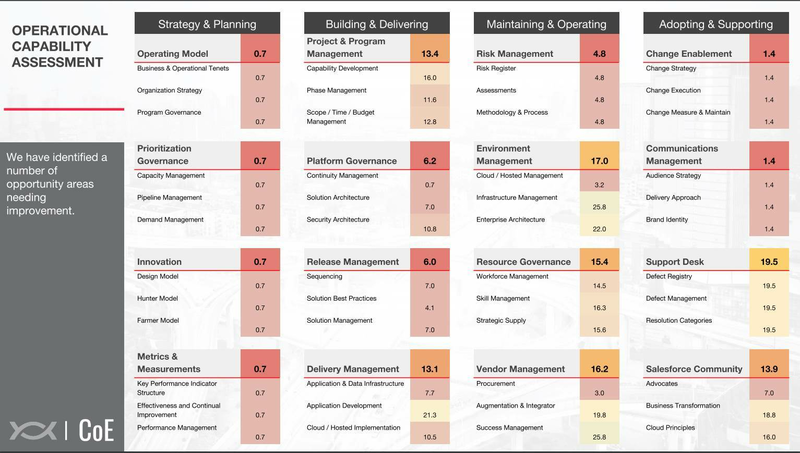 How Woolworths' capabilities rated in the initial Appirio assessment. Anguelo said that by contrast, Salesforce users with properly-functioning CoEs could focus on driving “continuous value” out of their Salesforce investments. This could be achieved by focusing on innovation, change enablement and by building a sense of internal community around the platform. However, he noted, “these are the thing that hardly ever get talked about or get the funding because what matters is the project delivery“. Anguelo said Appirio had changed that for Woolworths by bringing Salesforce users from across the enterprise together with IT and executives under the roof of a CoE. Internal funding was secured specifically to run the CoE and its initiatives. “Prior to this, Woolies had a capex only funding model so they were basically operating project to project, which was how they were funding their Salesforce resources,” Anguelo said. Affording the CoE its own funding gave it the best chance “to become the [central] trusted advisor for Salesforce” within Woolworths. One of the keys to success in the case of Woolworths was that the retailer put suitably senior executives into the CoE - and onto an executive leadership committee overseeing Salesforce use. 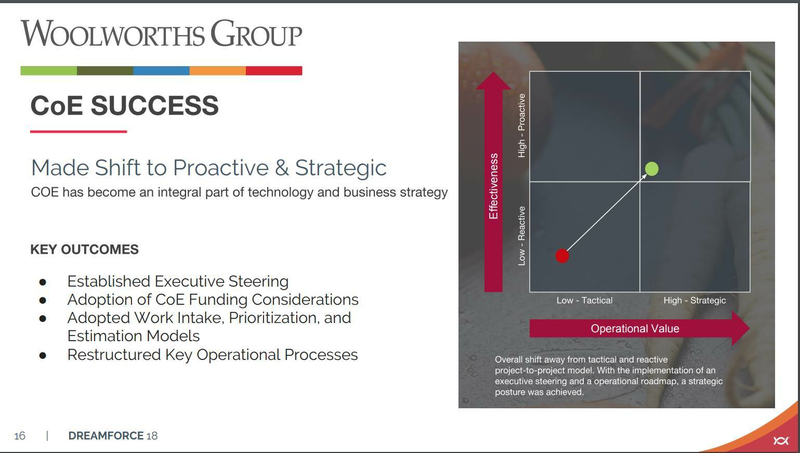 “The key is executive-driven strategy,” Anguelo said. Anguelo held up Woolworths as a case study for what other large Salesforce users could accomplish. “Reactive and tactical thinking are creating the problems that we get paid really well to fix, but ideally it would be nice if organisations can actually embrace some of these concepts like Woolies has,” Anguelo said.